3 posts categorized "Self Portrait Tuesday"
I have posted a picture of this wall before but not for SPT. It is just as you walk in my front door and is my personal history in photographs. There is a picture of me as a baby in my mother's arms, pictures of both children at various stages right up to Alyssa's graduation picture. 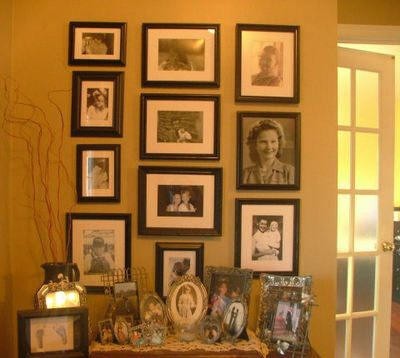 There are pictures of my granny and my great grandmother. Mitch's mom and his grandfather. This is a collection of my favorite photographs. I feel nostalgic looking at these pictures. They can evoke happiness or tears depending on my state of mind. The faces of all the people who have had the most influence in my life can be found here. One more post card arrived today. This one is from rock paper scissors. It is really cute and has a lot going on. On the front is a frisky little dog (he is a thumb- ink print) a little dog bone tag that says happy new year and a Chinese symbol stamp that is meant to bring good fortune to the recipient. I'll take that! On the address side is a picture of a drawing of a little girl putting on her shoes and a little dog helping her. hatu is stamped in the bottom corner and there is a little dog bowl with the name Ruby on it. Another little work of art delivered right to my mailbox! If that wasn't enough to make me smile today I went to the fabric store to buy the fabric for my "Granny Quilt". I didn't take a picture before taking it to my aunt, but I bought a print in a soft lilac background with roses and a solid piece in a tea stain color. My aunt didn't like the solid piece but I told her to trust me. She likes the brighter more bold colors. I wanted something soft, almost aged looking. I'll post pictures when she gets the top together. While at the fabric store I couldn't resist these. I am so weak! Notice a trend here? I guess I am diggin some paisley. I also went to hobby lobby. That place overwhelms me. I always feel like I can't possibly look at everything. If I go down this isle I am sure to miss something on that isle and who has time to go down all those isles? I did find the clearance isle. I have an internal homing device for a clearance isle and I was once again weak! 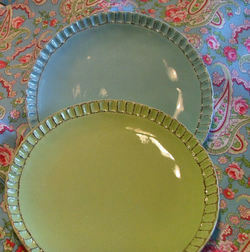 I had almost given up on the idea of aqua in my kitchen but look how good these plates look with this fabric. I bought it for purses but I may have to go get more. It looks like it was made to go with these clearance plates ($3.30 each) and who am I to try to keep them apart? Hey I'll use a coupon and if you get it on sale it can't be used in the "you have too much fabric already" argument, can it? I didn't think so. I know I can count on you crafty girls to back me up. OK enough time spent blogging. I need to spend some time actually doing. Reading Rebecca's blog today made me feel like such an under achiever. I have struggled with what to post for SPT. I fought with paint shop trying to create a photo collage of pieces of myself that would depict who I am and a story of my history. I need to start today and maybe I'll get that one posted next Tuesday. For today here I am. Not really a self portrait. I am cutting fabric. Working on purses. See the line of bags in progress behind me. Over my other shoulder is my sewing machine and above it are two pictures my mother took. At this point in my personal history this is me. Sewing. If you had asked me 20 years ago who I was it would have been a very different story. I was still in high school and just about to start dating my husband. I was a student, a sister and a daughter. My mother was still living and I had no idea where life would take me. Then in two years I was a young mother, a wife and an orphan. It is hard to be a young mother without a mother to turn to for advice or to share in the joys and fears of mothering. The next stage of my life I became a mother of two. A girl and a boy. I decided shortly after my son was born that I needed to go back to school to prove to myself that I could. I went to nursing school and did so much better in college than I did in high school. I became a nurse in 1994 and was scared to death but I loved my job. I went to work in the NICU where both my babies had to be cared for after they were born. As much as I loved being a nurse it is so hard to work such long hours and have small children at home. After working in the NICU for 3 years I took a nursing job that allowed me to work during the day and be home nights and weekends with the children. I feel like I lost a lot of time with them that I will never get back. About five years ago I was evaluated for a double lung transplant. It was decided about that time that working as a pediatric nurse was not good for my health and I had to leave my job. At first it was nice to be home with the children and have time to do things I hadn't had time to do around the house. After a while I began to loose my identity again. I used to be a nurse. I was still a mother and a wife but I needed something to be mine. I started to sew. I had never sewn before and though all the women in my family have been accomplished seamstresses I never had an interest. Why??? Why didn't I let my Granny teach me all the things she knew. I would love to have the chance to go back and sit at her knee at the sewing machine. I got out the little sewing machine my aunt gave me and gave it a try. I made some pillows for my porch. Then I made some curtains for my kitchen. I guess it is just in my blood. I feel like I have found myself when I can create something that I am proud of. So that is how my personal history has led me to the place I am today. I am a wife, mother, sister, niece, friend and I am faking it as a seamstress! I have been putting a lot of thought into this post. This is my first SPT post and the theme is Personal History. Funny how things seem to collide in this wold. I have known for a long time that this would be an emotionally trying year for me. I will be 38 this year. The age my mother died from a lung diseases she passed along to me. She is in the far right corner of this picture. It is a poor quality Polaroid picture under terrible lighting but when I found it today it was the most beautiful thing I had seen! I don't remember seeing it before. When looking for pictures and inspiration for this post I found a little photo album that had been my mother's. Written on the front was Grandma's brag book. Apparently after she died my Grandmother ( Left in the pix) put a few pictures in. This picture was taken in the NICU. That is little big girl when she was tiny baby girl. (About 4/12 pounds there). My mom is wearing oxygen in this picture and I am sure going to the hospital and up to the 4th floor was very hard on her. It shows on her face. Only now do I know what a struggle everyday things were for her. My Granny looks so sweet and excited talking to her first great granddaughter. My mother died about 7 months after this picture was taken and my Granny died 9 years later. Until I found this today I didn't know I had a picture of the 3 most special females in my life in one picture. I am just sorry I am not in it. Oh how I wish the four of us could spend time together. My mom told me she felt so selfish because she prayed to God to let her live to see me graduate high school, then to get married, then to see my baby girl born. Each time she felt blessed but longed for more time. I am so near the age she was when she left us and I feel like I have barely lived. She had so much living left to do. This is getting way to deep and depressing so in the vein of another post I read in tribute to someone special who left too soon I am going to try to list some of the things about each of these beautiful women that makes me smile! First my Mom Theresa. She was beautiful! She had clear blue eyes and milky white skin. She loved to shop, watch soap operas and eat in great restaurants. She was shy but loved people. She was generous and loved to give gifts. She would rather wear jeans and a t shirt than anything else. She spoke her mind and sometimes had the mouth of a sailor. She was very crafty. She passed lots of these traits onto me. Not the beautiful, blue eyes milky skin and sailor mouth part. Now my Granny. My angel. She raised me for most of my life because my mom was busy fighting demons of her own. I can't post all of the smiles she brings to mind. Here are a few. She had twinkling blue eyes. She never met a stranger and loved every one! Anyone who knew her loved her and probably called her Granny. She had a little beauty shop where little ladies got their hair done. Most of them had regular weekly appointments and got their hair rolled in rollers and teased. This was their church "do". I spent many hours in the beauty shop. She cared for her elderly father before he died, then her mother. All the while raising her daughter's two girls. She was a single mom and a single Granny who owned her own business in a very small town. She taught Sunday School and was the church custodian for a second source of income. She somehow found time to cook and clean house and sew and help with school work and was the most pleasant person I ever knew. She loved to cook and eat and sew and laugh. She loved to travel and shop and decorate for every holiday. She could out do Martha Stewart. She was a quilter and a crafter. She made all the food for my wedding. There will never be another like her. Every day I am aware of things she taught me. I was learning from her even when I didn't know it. Even though my mom may not have been as present in my life as my Granny I learned so much from her as well . I miss them both and know that they are watching over me.